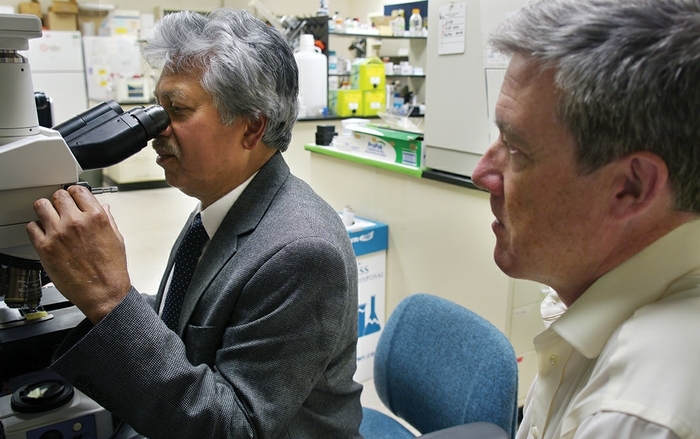 The eyes, it is said, are the windows to the soul, but for Arup Das, MD, PhD, they also hold clues to a cure for a devastating disease called diabetic retinopathy. About 15 years ago, the quest for a cure brought together Das, and cell biologist Paul McGuire, PhD. “It was a fortuitous partnership and an opportunity to apply what I had been doing to a more clinically relevant problem,” McGuire says. Das injects medication into the eyes of retinopathy patients to help them regain some of their lost vision, but the treatment falls short of sustainable relief. “I see all the limitations of our current treatment because half of the patients don’t respond to it,” he explains. Even patients who regain some of their lost vision must return for numerous injections, he adds. 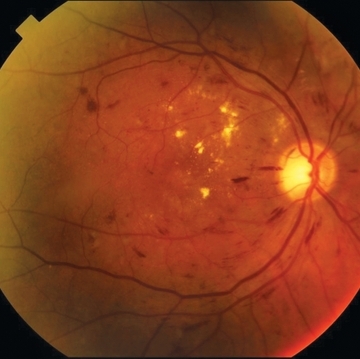 Now, the duo is testing a new treatment targeting a molecule called angiopoietin-2 that spurs new blood vessels in the retina but also causes them to leak. Taking their promising research from mice to people, the team is acquiring post-mortem human eye tissue in a new collaboration with Madras Diabetes Research Foundation in Chennai, India. 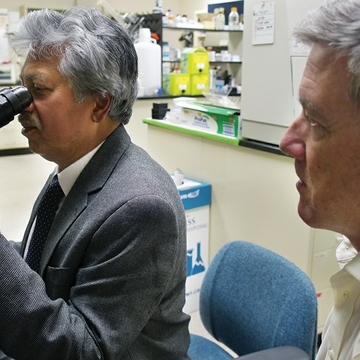 Das and McGuire are also investigating methods for spotting diabetic retinopathy earlier. “There is a period of 10 to 15 years where there are no signs,” Das explains. “You don’t see any bleeding in the retina, but silently there is some damage going on.” The late onset of the disease makes it challenging to treat. The pair’s research has been conducted in the Cell Biology and Physiology Department’s laboratory for nearly 17 years. McGuire says consistent funding pays for supplies, student researchers, administrative support and grant tracking, enabling the search for a cure to go forward. While Das and McGuire seek new treatments, Das offers some wise advice: "The most important way to prevent blindness is through diet and controlling blood sugar, blood pressure and blood cholesterol. If a patient doesn't control their diabetes, treatments will be ineffective."